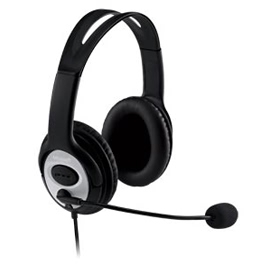 • High-quality audio for phone calls or listening to music. • Excellent reliability and clarity. • Automatically picks up your voice with remarkable clarity. • Listen and play for hours in total comfort. • Do more together, with Skype certified products from Microsoft. • Hear friends and family as if they were there. • Hear your favorite bands in high-quality audio. • Compatible with Microsoft Lync, Windows Live Messenger, Yahoo Messenger and AOL Instant Messenger.